The WeMos D1 R2 Uno based ESP8266 is a wireless 802.11 (Wifi) microcontroller development board compatible with the Arduino IDE. It turns the very popular ESP8266 wireless (WiFi) module into a fully fledged development board. The layout of this board is based on a standard Arduino hardware design with similar proportions to the Arduino Uno and Leonardo. It also includes a set of standard Arduino headers which means many existing Arduino shields can be plugged directly into the board (see note below). The development board also includes a CH340 USB to serial interface giving it the ability to be connected and programmed directly from your computer and requiring only a common micro USB cable – no additional interface hardware or configuration is required. Once connected to the computer, and drivers have been installed, the WeMos D1 will appear as a standard serial COM port. 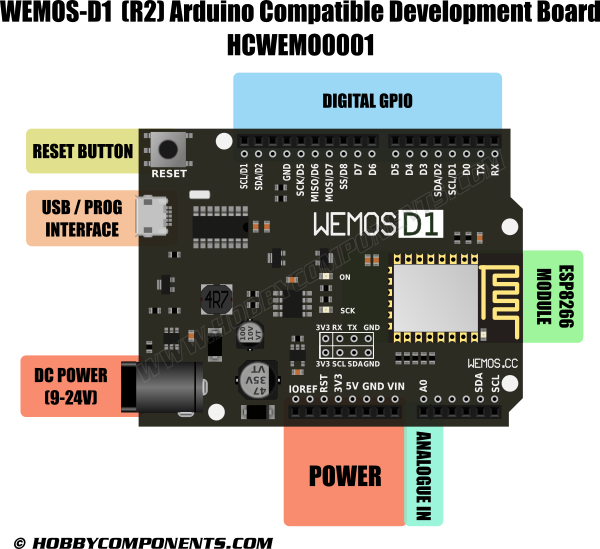 The WeMos D1 can be programmed directly from the Arduino Integrated Development Environment (IDE) which is freely available for download from the Arduino website (arduino.cc). Direct Arduino IDE support for this development board can be added with just a few mouse clicks via the built-in board manager feature. Programming the WeMos D1 via the IDE is then as straight-forward as programming any standard Arduino development board. Many of the default Arduino commands will work, including digital and analogue pin functions, and many examples are included in the IDE which demonstrate how to take advantage of the ESP8266s WiFi capabilities. These examples range from simply blinking an LED to turning the WeMos D1 into a stand-alone web server. Please note: This board requires a USB driver to be installed. Currently supported operating systems include all 32 & 64 bit versions of Windows 7,8, & 10. Drivers can be found at the bottom of this post. This a 3.3V development board and is not compatible with 5V hardware. Please check compatibility before purchasing Arduino shields. Drivers are available in the link below. Simply download and unzip them, plug in your WeMos D1 and when the new hardware is detected, point the wizard to the folder you just unzipped to and it should install without any problems. Once downloaded, double-click the zip file to unzip it. Run installer found in that folder. If asked to restart, do not restart just yet. Disclaimer: Libraries, example code, and diagrams are provided as an additional free service by Hobby Components and are not sold as part of this product. We do no provide any guarantees or warranties as to their accuracy or fitness for purpose. Descriptions and diagrams on this page are copyright Hobby Components Ltd and may not be reproduced without permission. Just followed your Get Blinky Tutorial for the WEMOS D1. I'm running win7 64 win the latest Arduino Ide. So I now have my Wemos esp Development environment up and running thanks to your tutorial.